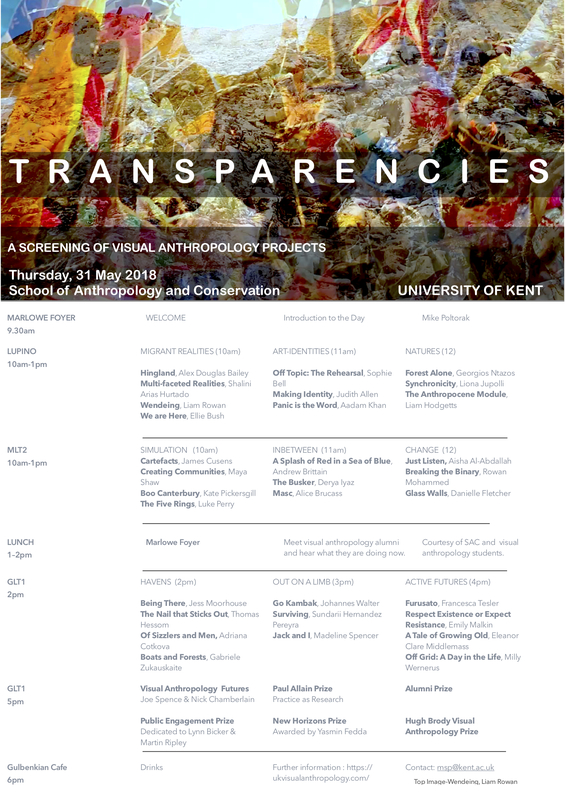 Please join us for the biggest student screening event in the history of visual anthropology at Kent. We have 31 short films screening during a full day event. To celebrate alumni will be joining us, in person and through video messages. We also have new prizes to reflect the shift in visual anthropological aspirations. Professor Hugh Brody returns to award his annual prize. He recently received an honorary doctorate at Kent, where he gave a remarkable and inspirational speech about his research in Canada. We hope he will tell us more of a recent visit he made to the people he worked with for his influential book, Maps and Dreams. He was educated at Trinity College, Oxford. Working as an anthropologist in Ireland in the 1960s contributed to the book Gola, The Life and Last Days of an Island Community. He worked with the Canadian Department of Indian and Northern Affairs, and his report Indians on Skid Row led to changes in government policy, especially in relation to Native Friendship Centres. He did extensive field work in the Arctic, living with the Inuit in the communities of Pond Inlet on Baffin Island and Sanikiluaq on the Belcher Islands, writing The People’s Land, Inuit and Whites in the Eastern Arctic. He supported the land claims of displaced San (Bushmen) in South Africa and was an adviser to the Mackenzie Pipeline Inquiry, a member of the World Bank’s famous Morse Commission and chairman of the Snake River Independent Review. ‘For nearly two decades now Practice as Research has been welcomed as a legitimate mode of publication within the performing arts. Unfortunately, it has taken too much of this period for it to become accepted culturally and across all institutions and mechanisms of research and evaluation, but the war has by and large now been won. Skirmishes still occur and lively debates continue about terminology (Performance as Research in the US, Practice-led research, artistic research in continental Europe, and most recently Practice Research without that troublesome separating qualifier). At its core though and semantics aside, this shift has enabled practitioners not just to teach within universities but also research and reflect on their practice, to the benefit of everyone. Former binaries between theory and practice and (at its crudest and most reductive) between those who do and those who teach, have increasingly eroded. Publishing practices have shifted accordingly, supported by rapid developments in digitization. For a discipline like theatre that depends crucially on its liveness this has not been without its problems, but it has certainly challenged and even revitalized our field which emerged initially out of literary and dramatic studies in European languages and English literature especially. Explorations in using film for documenting, explaining and showing performance practice are just at their beginning, perhaps as they are in other disciplines. Exciting times ahead. I am very happy to be part of this movement and to join you today to celebrate this potential. A New Horizons prize will be awarded by the wonderful filmmaker , Yasmin Fedda, who has made recent films on Syria. There will also be the Public Engagement prize in memory of Lynn Bicker and Martin Ripley. Martin Ripley featured in Joe Spence’s film, From the Cubby with Love, last year and sadly passed away last January. Please invite friends and interested students through our live facebook event. It starts at 9.30 and finishes at 7, but you can also dip in on the hour for different themed combinations of films. From 2 to 5 we will be altogether in GLT1 and the films have been chosen to reflect that. It will be a real celebration of our students and their engagement in the world. Filed under Contributors, Mike Poltorak.